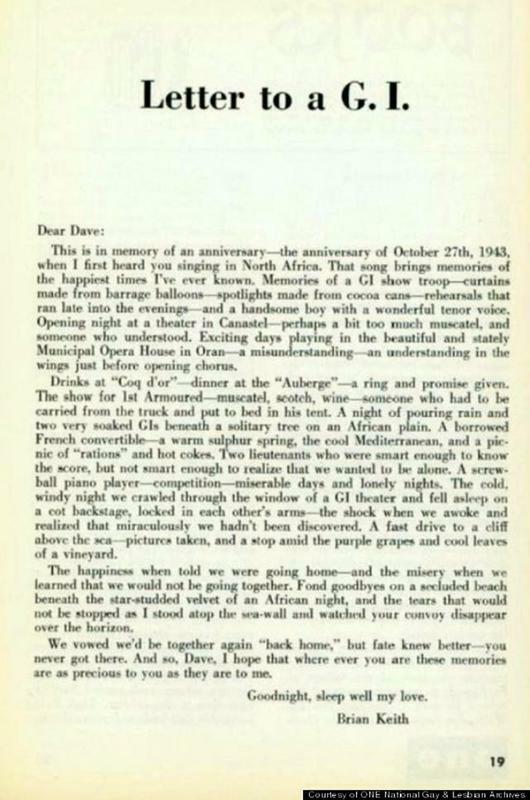 If you need a reminder of just how far we've come with LGBT rights in the military and larger American culture, a love letter penned from one soldier to his lover during World War II that has surfaced online might be all it takes. It seems the men became engaged while serving in Africa in the mid-20th century, but tragedy split them apart as the war was ending and they were set to return home. This is in memory of an anniversary -- the anniversary of October 27th, 1943, when I first heard you singing in North Africa. That song brings memories of the happiest times I have ever known. Memories of a GI show troop -- curtains made from barrage balloons -- spotlights made from cocoa cans--rehearsals that ran late into the eventings--and a handsome boy with a wonderful tenor voice. Opening night at a theater in Canastel--perhaps a bit too much muscatel, and someone who understood. Exciting days playing in the beautiful and stately Municipal Opera House in Oran--a misunderstanding--an understanding in the wings just before opening chorus. Drinks at "Coq d'or"--dinner at the "Auberge"--a ring and promise given. The show for 1st Armoured--muscatel, scotch, wine--someone who had to be carried from the truck and put to bed in his tent. A night of pouring rain and two very soaked GIs beneath a solitary tree on an African plain. A borrowed French convertible--a warm sulphur spring, the cool Mediterranean, and a picnic of "rations" and hot cokes. Two lieutenants who were smart enough to know the score, but not smart enough to realize that we wanted to be alone. A screwball piano player--competition--miserable days and lonely nights. The cold, windy night we crawled through the window of a GI theater and fell asleep on a cot backstage, locked in each other's arms--the shock when we awake and realized that miraculously we hadn't been discovered. A fast drive to a cliff above the sea--pictures taken, and a stop amid the purple grapes and cool leaves of a vineyard. The happiness when told we were going home--and the misery when we learned that we would not be going together. Fond goodbyes on a secluded beach beneath the star-studded velvet of an African night, and the tears that would not be stopped as I stood atop the sea wall and watched your convoy disappear over the horizon. We vowed we'd be together again "back home," but fate knew better--you never got there. And so, Dave, I hope that where ever you are these memories are as precious to you as they are to me.